Learn about Backbone Transportation Service and how to participate. Backbone Transportation Service (BTS) is applicable to firm and interruptible access to the SoCalGas® and San Diego Gas & Electric® (SDG&E®) integrated natural gas transmission system under Schedule No. G-BTS. BTS participation requires a Master Services Contract (MSC), a Receipt Point Master Agreement, an Electronic Bulletin Board (EBB) Agreement, and creditworthiness. Purchase and use off-system deliveries from the SoCalGas and SDG&E integrated natural gas transmission system to all interstate and international pipelines, excluding California producer delivery points (See Rate Schedule No. G-OSD). SoCalGas will hold an Open Season in the summer of 2020 in which parties may bid for firm rights for BTS service at the applicable tariff rates for periods from October 1, 2020 through September 30, 2022 via a SoCalGas online bidding system. Any remaining capacity will be open to parties via SoCalGas ENVOY in late September 2020. All current Schedule M Receipt Point Master Agreements (RPMA) and Schedule K Pooling Service Agreements (PSA) continue in effect. Noncore customers of SoCalGas and SDG&E with Contracted Marketers do not need to make any assignments of historical bidding rights. Contracted Marketers will automatically receive their rights. Noncore customers who wish to retain or reassign their historical bidding rights may do so at least 60 days prior to the start of step-two. To find the latest BTS rates, refer to the Backbone Transportation Service tariff. Customers holding firm BTS capacity will be able to nominate natural gas for delivery in accordance with SoCalGas Rule No. 30, Transportation of customer-owned natural gas. SoCalGas will contract with any creditworthy party for Interruptible Off-System delivery under the G-OSD tariff. SoCalGas will make available physical displacement capacity at the receipt point on an interruptible basis at the applicable G-OSDI rate. 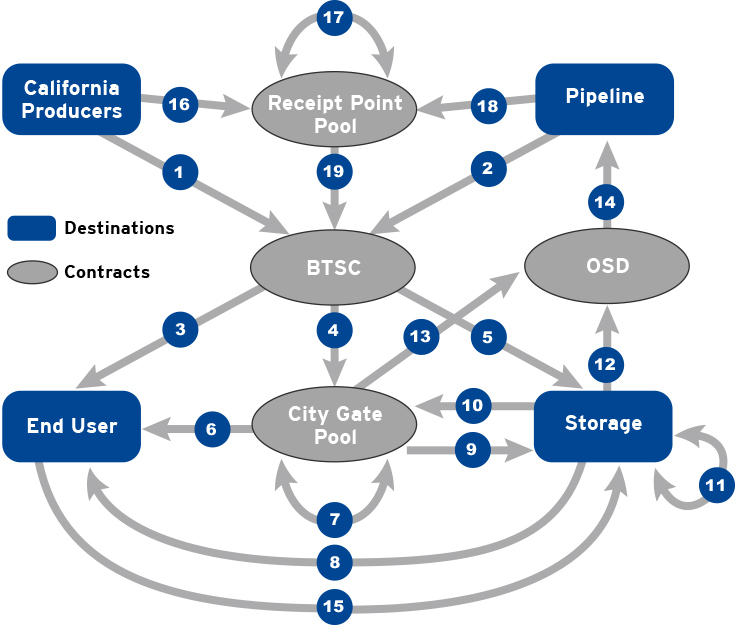 Pooling is the administrative aggregation or disaggregation of natural gas supplies at the Citygate and receipt points and is defined in SoCalGas’ G-POOL tariff. Each customer may have a single pool contract where they will be able to nominate supplies coming through any Backbone Transportation Service Contract (BTSC) and nominate supplies out of the pool contract to end-users, other pool contracts, off-system, or to storage accounts. The Citygate and receipt point pool contract will be required to balance through each nominating cycle. A customer may opt to designate one and only one nominating agent or trading agent in addition to itself at any one time to nominate on all BTSCs under a customer’s RPMA. Customer must provide appropriate written authorization to SoCalGas of its intent to add or change a designated nominating or trading agent via the Nomination and Trading Authorization Form ( Form No. 9924 ). Such designation shall be subject to that agent complying with applicable tariff and contractual provisions. Customer shall provide appropriate written notice to SoCalGas of its intent to terminate a nominating agent via the Termination of Nominating or Trading Agent Form ( Form No. 9926 ). SoCalGas will provide eligible participants the opportunity to buy Backbone Transportation Service Rights before, during, and after the Open Season Process. Open Season step one and Open Season step two participants will receive an email with their maximum bidding rights based on historical usage and all necessary agreements. All participants will utilize the SoCalGas online bidding system for the Firm Receipt Points Access Rights during the Open Season Bidding process. After the Open Season is completed, customers will be able to buy rights via SoCalGas ENVOY. Below are the available Open Season options. Buy Firm Rights in step one and two by accepting the set-asides or bidding rights provided by SoCalGas via the Open Season online bidding system. Buy Firm Rights in step three via the online bidding system. Re-contract your awarded rights by exchanging them to a different receipt point. The Open Season Process steps are available to eligible creditworthy participants. Participants must have a Master Services Contract, complete a Receipt Point Master Services Agreement (RPMA) and register through the online bidding system at the SoCalGas website. This online bidding website will be available only during the Open Season process. To be posted upon completion of bidding step and round. End-use customers in good credit standing with SoCalGas are deemed creditworthy to their specified maximum bidding rights. 1Eligible end use customers may assign their Open Season bidding rights to a third party. The assignment of rights is for the entire volume and term. The form and additional details can be found at the Backbone Transportation Service Assignment Form section. SoCalGas will be hold webinar training sessions in the Open Season process. Dates are to be determined. The Backbone Transportation Service Assignment form is designed to allow eligible participants with bidding rights in step two of the Open Season to assign those rights to a third party (“assignee”). This enables the assignee to bid in step two of the Open Season and be the contract holder of the Backbone Transportation Service rights. The maximum bidding rights would be irrevocably transferred (unless cancelled prior to the Open Season step two) to the other party and BTS rights awarded during step two of the Open Season would be held in the name of the assignee. The assignment or transfer of rights is for the entire quantity and term and may not be divided between separate assignees. The election form must be completed by the end-use customer to allow SoCalGas to prepare the contracts, verify credit, and complete other administrative duties necessary for parties to bid for firm receipt point access rights during the Open Season, step two. If a participant would like to retain their own backbone transportation service rights, they must notify SoCalGas, in writing, at least 60 days prior to the beginning of step two. These notifications should be sent to the participant’s account executive. New participants to the BTS Open Season must first establish credit with SoCalGas. Non-core end-use customers of SoCalGas and SDG&E are deemed creditworthy up to their maximum bidding rights and do not need to complete the application. Current RPMA holders should review their credit limit with SoCalGas credit department based on G-BTS rate schedules. Additional requests for credit and all other interested parties in the BTS Open Season must complete and return the Contract Request form (PDF). Once the contract request form is reviewed by SoCalGas, a credit application will be sent to the requestor.